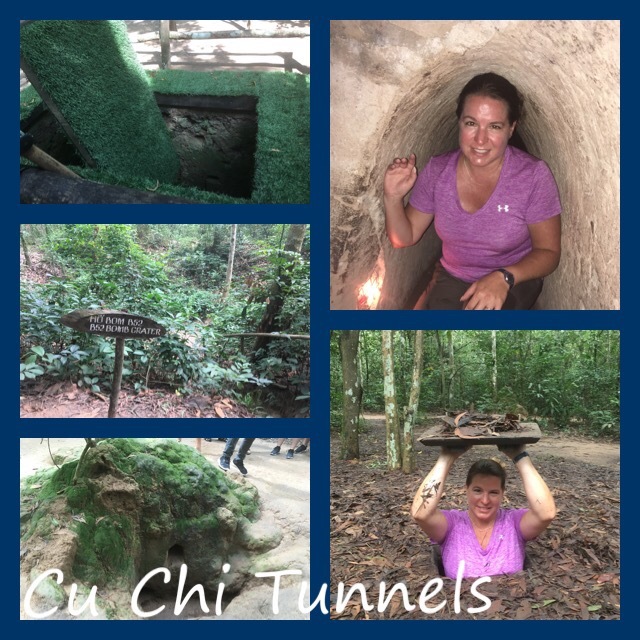 Another place I’ve been super curious about since I read about it when I was 16 is Cu Chi and its famous tunnel system built by the Viet Cong. Imagine living underground in a tiny space for 20 years! Mind boggling. I paid extra for a boat tour instead of a bus tour, and it was sooooo worth it! We set off on the Saigon River at 7:30 am and got there at a little after 9; the buses get there around 10-11, so we had the place basically to ourselves for the first hour. It was nice! There were eight people in the group. Everyone else was from Australia or New Zealand. I don’t know how I kept stumbling on tours where everyone except me was from the same area of the world! It’s about a 2-hour tour, but you only spend a few minutes in the tunnel, if you want to. You start by watching a 10-minute documentary about Cu Chi made in 1967 in Vietnam (but narrated in English; I don’t know if English was dubbed in later or if it was originally in English for the international community, which Vietnam did do for banners for protests to get the attention of the international community). I’ve always had the utmost respect for the ingenuity, determination, and cunning of the Viet Cong and the Vietnamese people, but the visit made that respect sky rocket. It was an absolutely eye-opening experience, and my favorite cultural tour of the two weeks. Then it was time to climb through one! Of our eight, only three wanted to try, a man and a young woman, along with me. I was so eager I actually got this really emotional swell inside me as we started down that made me tear up! They’ve widened the tunnels 30% for tourists, but they were still cramped. I had to crawl in some places it was so low and narrow. The length of the tunnel they take you down is 100 meters, with exits every 20 meters so people can get out if they want. The man bowed out at 20 meters. The girl was unsure whether she wanted to get out or not and asked me how far I was going. “The full 100 meters!” At that, she said she would go the whole way, too. I was sweaty and winded pretty quickly. It was the windedness that surprised me (with temps from 105-130 F every day, I was always sweaty!). I didn’t expect to be winded! And so easily! I chalked it up to the lower oxygen levels underground (and we were only on the first level; the VC dug down three levels deep, with families living on the third level). At the end of the 100 meters, I emerged victoriously! And then the guide told us that in addition to widening the tunnels, they pump oxygen in them for tourists too. So much for my theory! I was clearly winded from the mere effort of trying to make my way through the cramped space. I can’t even imagine what it was like three levels down! We had a really super delicious lunch and then headed back down the Saigon River. I just love boat rides, so feeling the wind in my face and seeing river life as we sped along was wonderful. Back at the hotel I did a quick load of sink laundry (I miss my washer and dryer! 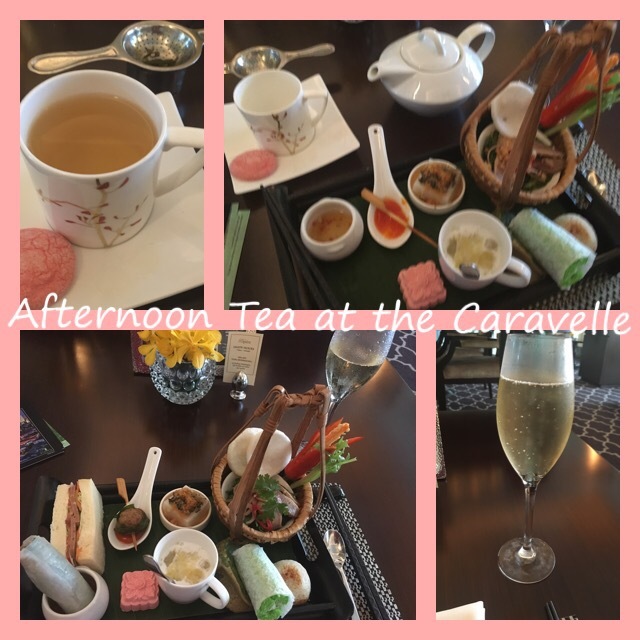 ), hung out at the pool a bit, had formal afternoon tea in the hotel (the Vietnamese and not the Western menu, TYVM, with lotus tea and the champagne option! ), which was insanely amazing (except for one thing that was pretty gross), and then headed out in the rain to a gallery featuring hand-made Vietnamese lacquer items. I’d known for months that my souvenir from Saigon was going to be an authentic lacquer item that the area is famous for, and I hadn’t seen any quality pieces, so my hotel recommended the gallery, and I’m very happy with the piece I bought (chopsticks and a chopstick stand, easy to transport and nice to display in my kitchen, where I spend so much time and can look at them and think of my trip). 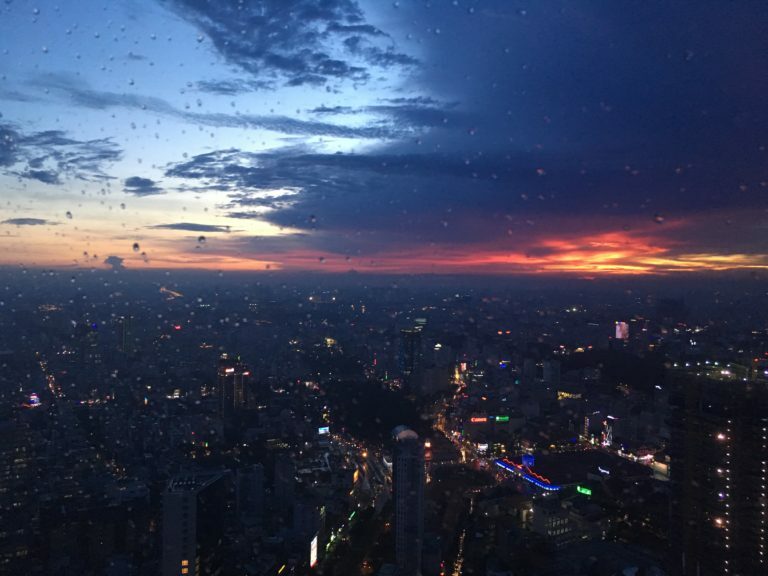 I’d hit all three historical, journalist rooftop bars, but there was one bar I was not going to miss: the bar on the 52nd floor of Saigon’s tallest building. I went up (that was a story in and of itself and such a uniquely Vietnamese process!) and watched the sunset from up high. And, knowing it was my last sunset, yes, I *may* have cried. Then it was time to go meet up with John and Jan from my street food tour to explore more of Saigon’s rooftop bars (there’s enough that there’s actually top 10 lists going around of the best ones). We only ended up going to two, but we stayed out until after 1 am, even though I had to get up at 4:45 am to begin 40 hours of travel. Not a smart move, but they are awesome and I also didn’t want to say good-night to Saigon! It was another great night to cap off a great day. Jan, John, and I are already planning our 2018 return trip to Vietnam together! It truly was one fascinating, amazing day after another. I kept calling it my once-in-a-lifetime trip, and it exceeded all expectations! PS Thanks for following along. It means a lot to me! Yeah, you went all the way through! High five! I did too, but I am not ashamed to admit, I teared up multiple times in the tunnel myself. I was actually more scared in the little pitch black entry hole like in your picture than when we did the actual tunnel. It really was amazing learning how intricate the tunnels were. Good call on the boat option, we went that way too and it was totally worth it. Did they cut you fresh fruit on the boat? They made us the nicest lunch for the way back. Yes, we had amazing fresh fruit on the boat! Every other tour I went on allotted one bottle of water, but this tour had unlimited water, green tea, and Coke as well as tons of fresh fruit. That was the first day I didn’t have breakfast included in my room rate (but I *had* to stay at the Caravelle! ), so I was just going to do without and go until lunchtime, but they surprised us all with a banh mi sandwich for breakfast! Plus the fruit. And the lunch they served us whole still at Cu Chi was amazing! I am somewhat claustrophobic so I doubt I could even get in the tunnel, but yay, go you, for making it all the way through! Don’t tell me this is the end of your journey already. Safe travels! Unfortunately, it was the end. 🙁 But I’m going back in 2018! And you should totally go with me! I’m so glad you got to experience the tunnels, but I’m even more glad that your enthusiasm for it kept your “tunnel mate” going too. 🙂 Your trip was over too fast! I wanted to read more! 🙂 So tell us more about the “gross thing” at tea and your trip up to the top of Saigon’s tallest building. Keep the journey going even though you’re back on American soil. My trip truly was over too fast! I’m so flattered and honored that you read along and want to read more! You’ve inspired me to tell some untold tales from the trip now that I am not trying to do updates on that stupid iPhone keypad with my fat fingers, lol! Wow, I never would have been able to hack that tunnel. I’m impressed! And agree that I can’t imagine how the VC lived and traveled through them. Those are impressive survivalist skills for sure! Even if you chose not to go in the tunnels, you’d have loved the rest of the tour and learning about the impressive survival skills. Awe and respect. Just awe and respect. I’m so sorry the pics gave you the heebie-jeebies! Definitely don’t think too hard! I didn’t get the heebie-jeebies, and I still can’t wrap my head around living in them for a day, much less 20 years! Such an amazing adventure, Dana! I am in awe of your spirit and pea green with envy!